More purple than not. Posterize. Here's a navigable version to peer in on the nitty gritty. Red/green colorblind? This version might make the variation more discernible. 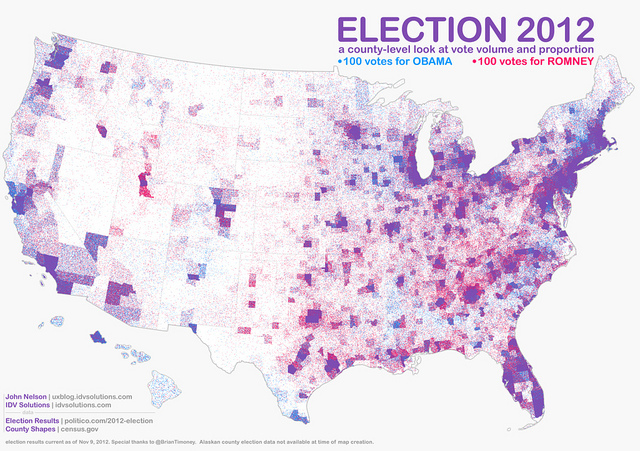 This is a mixed density visualization of the volume and proportion of votes in the 2012 US Presidential election. Each point represents 100 votes. This method avoids the geo-social visual bias of large geographic areas having small populations overwhelming the overall picture. In this way both the relative volume and geographic distribution are apparent, as well as the partisan proportions throughout. Areas of mixed voting appear as a blended purple cloud, while areas more homogeneously represented appear more red or more blue. The data comes from a running update of the latest vote returns per county aggregated and made available by the fine folks at @GuardianData in the case of the original image and @Politico in the case of the updated version. Special thanks to @BrianTimoney for his help. For print options regarding this map, visit here. Wonderful map, but I suspect the entire state of Idaho's totals were inadvertently rolled into Idaho County, Idaho. That big purple blotch in north-central Idaho only has a population of about 16,000 people and 7,500 voters. Thanks Adam, a new batch of data and a more complete map is now posted. Should be all squared away. Very good visualization that overcomes almost all of the problems that these things normally have. My only complaint is that counties (I'm assuming that where the outlines come from) that encompass large bodies of water end up looking like they're less populous due to diffusion. Thanks, Nick. In the updated map above, I've carved out the Great Lakes so the dispersion is more realistic. This is a good way to visualize the voting data but why can't you use a decent boundary file so that Michigan looks like a mitten and not a blob? I would think this would be a priority for a Lansing based company. Come on, man! Only when a Lansing-based company and an Ann Arbor-based company converge on a shared goal can it become a reality. This was a test of that cooperation intersection and now all has been set right. The normal way of scaling images to web page sized does not work well with this data visualization. The dots in less populated areas get scaled down too small and lost in the whiteness. For example, rural North Dakota in the image above just looks white, whereas in the original 61 megapixel version it has more red dots than blue. If the tools you are using support it, I would recommend regenerating the image at lower resolutions with each dot no smaller than a pixel, rather than generating it at high resolution and scaling it afterwards. i like this though i'd love to see a map showing net votes (Obama votes - Romney Votes) or something showing the net as a percentage of the margin. Above you stated: "Areas of mixed voting appear as a blended purple cloud, while areas more heterogeneously represented appear more red or more blue." What was your criteria for when an area voted "heterogeneously", thus turning the color from purple to red or blue? The purple color is in the eye of the beholder. Every dot on the entire map is either pure blue, or pure red. I like this map a lot, but I have one big problem with it. I am colorblind, as are about 10% of men. I would much prefer a more neutral color, or greyscale, palette. I cannot really see the red at all! @davidme see the bottom of the map: "Alaskan county election data not available at time of map creation." Ugh, dot density maps are terrible if they are not done properly. Results by county only? Even at a national scale not a very good dataset. With dot density maps, you need the smallest geography possible. With some work, one could produce this map using county subdivisions or even better, voting districts. Both geographies which are available from the Census. The hardest part is retrieving the results data by those geographies. Then, on top of that, using exclusion zones properly. What happened to DC? A big chunk of it would be pure blue, but I imagine there would be some purple in the NW quadrant.